Large companies are not startups, nor should they strive to be. Steve Blank’s distinction between searching and executing is a powerful metaphor for startups to know where they are on their journey. But for established companies the work is in knowing how to search while executing. They also have to be clear that they are not simply searching for cool new ideas. It is the combination of cool new ideas and profitable business models that defines successful innovation. So instead of viewing themselves as single monolithic organizations, established companies have to take an ecosystems approach to their business. Every contemporary company has to be a balanced mix of established products and new products that are searching for profitable business models. The innovation ecosystem and the products within it have to be managed appropriately depending on where they are on their innovation journey (i.e. searching vs. executing). As outlined in the book The Corporate Startup, co-authored by Dan Toma, Tendayi Viki and Esther Gons, established companies can use these five core principles to build their innovation ecosystems. Innovation should not be conducted as a guerilla movement, hidden and protected from the main business. It must be part of and aligned with the overall strategic goals of the organization. This is important when it comes to later transitioning innovation projects into the core product portfolio. Just like venture capitalist investors have investment theses, every large company must have an innovation thesis. An innovation thesis clearly sets out a company’s view of the future and the strategic objectives of innovation. A thesis also sets the boundaries or guard rails for which innovation projects the company will or will not consider investing in. In addition to deliberate strategy, the company must also use its innovation process as a source of emergent strategy that is responsive to changes in the market. To achieve its innovation thesis and strategic goals, an established company should set itself up as a portfolio of products and services. This portfolio should contain products that cover the whole spectrum of innovation; i.e. 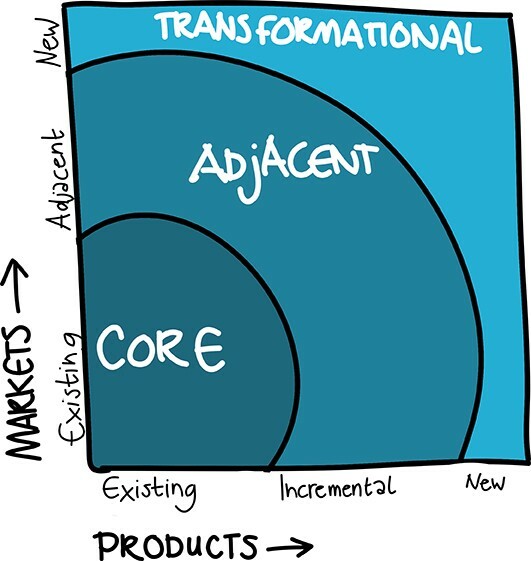 core, adjacent and transformational. A portfolio should have early stage products, as well as mature and established products. A company may also consider having in its portfolio disruptive products that are aimed at the lower-end or emerging markets. The goal is to have a balanced portfolio in which the company is managing various business models that are at different stages of their life. The balance of the product portfolio should be an expression of the company’s overall strategy and innovation thesis. In order to execute on its thesis and manage its portfolio of products and services, the company needs a framework for managing the journey from searching to execution. There are several great innovation frameworks out there; for example Ash Maurya’s Running Lean framework and Steve Blank’s Investment Readiness model. 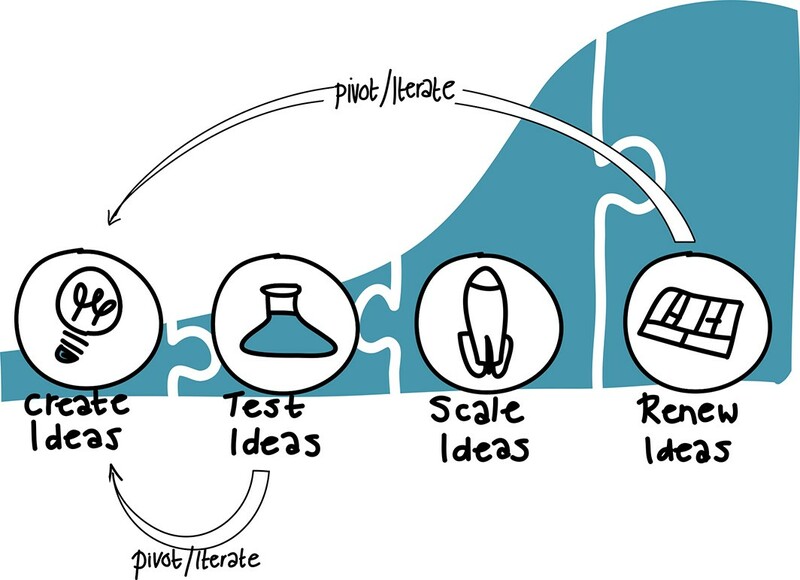 All these frameworks can be synthesized into the three simple steps for innovation; creating ideas, testing ideas and scaling ideas. Every now and again, a company may decide to refresh the business models of it existing products through renewing ideas. Having an innovation framework provides a unifying language for the business. Everybody knows what phase each product or business model is in. This then provides the basis of how a company can manage its investment decisions and product development practices. With an innovation framework in place, the company now needs to make sure they are using the right investment practices and metrics to measure success. Traditional accounting methods are great for managing core products. However, when managing innovation a different set of tools are needed. We propose that companies should use incremental investing based on the innovation stage of their products. This philosophy is based on Dave McClure’s Moneyball for Startups. We also propose three sets of innovation KPIs that companies should be tracking. Reporting KPIs are designed to track the activity and work being done on new ventures as they move from idea through to scale (e.g. validation velocity). Governance KPIs help paint a better picture for the company as to whether or not to continue investing in particular ideas (e.g. how close are the teams to finding product-market fit). Global KPIs examine the overall performance of innovation within the context of the larger business (e.g. percent of revenue in the last 3 years). In addition to managing investments in innovation the right way, the way product teams develop products has to be aligned to the innovation framework. Pearson’s Lean Product Lifecycle is accompanied by great playbook that provides guidance to product teams as to the right behaviors to engage in during searching versus executing. Adobe’s Kickbox provides similar guidance, tools and resources. The core principle for innovation practice is simply that no product can be taken to scale until it has a validated business model. As such, during the search phase the job of innovators is to validated their value hypotheses (i.e. does our product meet customer needs) and their growth hypotheses (i.e. how will we grow revenues and customer numbers). This process requires that teams validate both the attractiveness of the product to customers and the potential profitability of the business model. This is product-market fit and our definition of lean innovation. 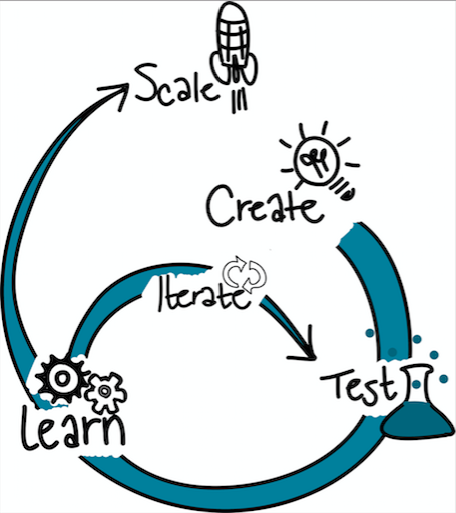 These five principles combine to help create an innovation ecosystem. The first two principles (i.e. thesis and portfolio) focus on innovation strategy, the next two principles (i.e. framework and accounting) focus on innovation management and the last principle is where rubber meets the road and the company begins interacting with customers and validating business models. Most innovation labs tend to just focus on this last part (i.e. innovation practice). However, without a supportive ecosystem in place, products coming out of innovation labs have high mortality rates. This is why applying all five principles is important. As you can see from the graphic above , these elements are interconnected; each representing a build-measure-learn loop of its own. To the extent that strategy informs investment decisions, the success of these decisions in turn inform strategy. To the extent that investment decisions impact innovation practice, innovation practice produces learnings that inform investment decisions and in-turn inform strategy. This is an innovation ecosystem at work. Each interconnected piece responding to data from the other pieces. Such a holistic approach allows companies to innovate like startups, without having to act like startups. Want to implement these principles and create or improve the innovation ecosystem at your organization? Join The Corporate Startup 1-day masterclass with Dan Toma on Feb 1st, in Frankfurt (Germany). If you have innovation in your title, or as a mindset, this is your tribe. Join the #1 glocal community for corporate innovators at our events or learning programs, as a member or via our newsletter. (c) 2019, Innov8rs.co. Registered in The Netherlands.